Update: iOS 10 problems persist in Apple's new iOS 10.3 update, but many can be fixed. Here's what may be crashing your iPhone. New problems always seem to emerge whenever a new update hits, so we're here to tell you how to fix iOS 10.3 issues. If you have a problem with iOS 10 you don't see here, let us know on Twitter and we'll do our best to help, and we'll tell you how to solve right on them this page. Just know, you're not alone if you're experiencing iOS 10 problems, as the iPhone and iPad update has run into a number of issues. Here's how to fix the most common glitches, from poor battery life, to spotty Bluetooth connectivity, to iPhones and iPads bricking when trying to update. iOS 10.3 is the newest iPhone and iPad update, which means it fixes a number of problems, but it now takes what seems like forever to install. Don't be alarmed if it eats up 30 minutes of your time to update about 500MB. That seems like a problem, but Apple has re-arranged its filing system. Apple File System (APFS) replaces the older HFS+ way of arranging your files, and now it's optimized for flash and SSD storage. Great. But it requires patience. Just an extra caution: Make sure you backup your iPhone before updating to iOS 10.3. We haven't experience problems, but you never know. Some users have tweeted at us saying that their iPhone 4S won't work when they try to update to iOS 10.3.
iOS 10 compatibility goes back to the iPhone 5, iPhone 5C and the iPad 4th Gen. You can't upgrade the iPhone 4S or the iPad 3rd Gen, sadly. iOS 10.3.2, when it graduates from its beta, may not work with 32-bit iPhones and iPads, like the iPhone 5, iPhone 5C and iPad 4th Gen.
iOS 11 may bring a new round of incompatible iPhones and iPads later this year, so you want to read on the redesigned iPhone 8 rumors. Solution for now? See our best iPhone deals guide for the cheapest ways to upgrade your Apple smartphone right away. Ever since the iOS 10.1.1 update battery life problems, people have been asking why their newly updated iPhone turns off at around 30%. Other people are noticing that they iPhone batteries now drop from 100% to 50% in under an hour after installing iOS 10.1.1. Apple appears to be aware of the problem, and this fix is simple: update to the newest version of iOS 10.3. It recently launched iOS 10.3.2 beta, which has fixed the issue for some people. We haven't seen this problem persist in the newest version of iOS 10. If you still experience low battery life, flaky Bluetooth and unreliable Wi-Fi connections with iOS 10.0.2, read on below to find the solution to your iOS 10.0.2 problems. Hopefully iOS 10.0.3 and beyond will do a better job at fixing these issues. There's a lot of newness happening with September 13's big software update, but that also means we've been experiencing poor iOS 10 battery life, and with the recent release of iOS 10.0.2, these problems remain. iOS 10.1 will likely address battery life drain, but until that happens, here's what we found works to increase the uptime of our iPhone and iPad. Turn off background app refresh in Settings > General > Background App Refresh. It'll give you a list of apps, and you don't really need a lot of these to constantly update in the background. It's a big battery life killer. Turn off Fitness Tracking and non-essential apps tucked away in Settings > Privacy > Motion & Fitness. If you have an Apple Watch, you don't need fitness tracking on your phone. We also found Health, Microsoft Health, TripAdvisor and Waze keeping tabs on us and wasting battery life. No thanks. Turn Wi-Fi on and off at the right times. When you're at home or work, make sure you're connected to Wi-Fi instead of cellular. When you're out, prevent your iPhone from constantly hunting for open Wi-Fi networks when there are none you can join. The swipe-up-from-the-bottom Control Center has a handy toggle for W-Fi. Keep that brightness slider in check. Display brightness is the #1 battery life killer, so stop lighting up your phone every two minutes just to check the time. Spoiler alert: it's two minutes later than the last time you checked. Keep track which apps are draining your battery life the most. Now every app is tuned to the iOS 10 update and could be wasting precious battery. Head to Settings > Battery to see the top villains here, especially Twitter and music-streaming apps. If you have an iPhone 6S, then the cause could be a faulty battery. The good news is that Apple will replace your iPhone 6S battery for free. Check out our guide on how to get your iPhone 6S battery replaced for more information. While the beta went well for us, the final launch of iOS 10 has bricked a number of iPhones and iPads. That's disheartening for Apple fans after a solid three-month beta. The solution here is a simple one, thankfully: good ol' iTunes (you hate it, but love it when you need it) has had success in restoring afflicted Apple devices. Time to resort to a Mac or PC. With the news of iOS 10 bricking iPhones and iPads around the world, now is a good time to mention that you should always back up your devices before updating. Over-the-air (OTA) updates have made us lazy when it comes to backing up our precious iPhone and iPad data. And iCloud backups work, but only if you're paying Apple enough to back up your entire storage capacity. There are some nasty bugs out there that can make your iPhone crash just by receiving a text message. To protect yourself from these bugs, make sure you upgrade to the latest version of iOS 10, where the bugs have been fixed. If your iPhone gets affected by this bug, restart the device then update to iOS 2.2.2 or later. For more information check out our guide on how to avoid the latest iPhone-crashing bugs. This problem creeps up every year, and sadly it's no different with iOS 10. Even after Apple released iOS 10.0.2 people are still experiencing Wi-Fi and Bluetooth problems. In iOS 10.2 people are also complaining about their devices disconnecting from the Wi-Fi when they are locked. Here's what we've done to resolve both Wi-Fi and Bluetooth problems in one fell swoop: Go to Settings > General > Reset > Reset Network Settings. It's the third option down, and you'll want to avoid Reset All Settings and Erase All Content and Settings. By selecting Reset Network Settings you'll keep your data intact, but your wireless connects will be back to their default settings. That usually solves our issues. Some users are experiencing problems with the AssistiveTouch feature, which makes it easier to use some commands such as multi-finger gestures. In iOS 10.2 there have been cases where this feature becomes unresponsive and freezes. To fix this, try turning AssistiveTouch off and on again. To do this, go to Settings > General > Accessibility > AssistiveTouch and toggle the feature off and on. A new feature of iOS 10 allows apps to install themselves via the iMessages App Store. These extensions can make using the Messages app easier, as you can quickly check out third party apps from within Messages, but it can also make the app more complicated to use. To stop iMessage extensions from automatically installing, open up the Messages app and tap on the arrow icon, then 'Apps'. Next, tap the four circles icon in the bottom-left of the screen, then select the 'Store' icon. Tap 'Manage' then toggle the switch next to 'Automatically Add Apps' to off. If your iPhone or iPad running iOS 10 crashes - or the screen becomes unresponsive - when sending messages, then try these methods to fix the problem. First reboot your iPhone or iPad to see if that fixes the problem. If not you may need to delete the conversation thread if a particular conversation is causing iOS 10 to crash. To do this, open up the Messages app, then tap and hold on any sent or received messages in the conversation. From the menu that appears, tap 'More' then tap on the Trash icon. At the top of the screen tap 'Delete All' - this will erase all the messages in the conversation, so if any contain important information, make a note of them. If messages are still not sending, open up Settings, then go to General > Reset and tap on 'Reset Network Settings'. If that doesn't work, then you may need to reset your device. Open up Settings, then tap on 'General'. Scroll down to 'Reset' then tap on 'Reset All Settings', then tap it again to confirm. iOS 10 changes the home button functionality now that 'Slide to Unlock' is no more. It actually makes you press in on the Touch ID fingerprint sensor. Is that too much work for you? Apple didn't seem to think so when it developed iOS 10, but here's a quick fix in case you want to go back to the old way of unlocking your phone. It's super-buried in iOS 10's settings. Go to Settings > General > Accessibility > Home Button (midway down the page) and turn on 'Rest Finger to Open'. This will enable you to open your iPhone or iPad with Touch ID, without having to press the home button any more. If the Home button doesn't work, then press the Sleep/Wake button to lock your device, then wait a few seconds and then press the Home button. The iPhone or iPad should wake up. If it doesn't restart your device and see if that helps. If not, check for any dust, dirt or anything else around the Home button and clean it with a cloth. After all that, if it still doesn't work, contact Apple Support. Some people are complaining that the button used to put their iPhone or iPad to sleep, and to wake it up, isn't working in iOS 10. To fix it try pressing and holding the Sleep/Wake button, and if you see a "slide to power off" message, do so to turn your device off, then turn it back on. If you can't turn it off, force restart by pressing and holding the Sleep/Wake and Home buttons for ten seconds until you see the Apple logo. On iPhone 7 and iPhone 7 Plus, press and hold the Sleep/Wake and Volume Down buttons. If that still doesn't work, contact Apple Support. If you have an iPhone 5 you be be eligible for a replacement. Some people have noticed that their iPhones no longer vibrate in iOS 10 when they receive messages. To fix this, first try restarting the iPhone by pressing and holding the sleep button and the Home button for around 10 seconds. The iPhone will restart and the Apple logo will appear. If this doesn't work, then you may need to factory reset your iPhone. Before doing this, make sure you back up all your files and settings, as performing a reset will clear all of your data from the device. Go to Settings > Touch ID & Passcode and enter your passcode. Turn off iTunes & App Store, then reboot your device. Go back to Settings > Touch ID & Passcode and turn on iTunes & App Store. You may need to remove and then rescan your fingerprints. To do this go to Settings > Touch ID & Passcode and scroll down to the list of fingerprints. Tap on the fingerprint you want to delete, then select 'Delete' and restart your device. Once your iPhone or iPad restarts, go back into settings and add your fingerprint. Touch ID should now work. If you restart your iPhone you'll be reconnected to the network. While this is a temporary solution, it's not perfect, as if you lose signal again you won't be able to reconnect until you restart. You can also turn on Airplane mode, then turn it off again to reconnect. Some mobile networks are also suggesting that you reinstall iOS 10, but this time update it by plugging it into your PC or Mac and using iTunes. For more information on updating via iTunes, check out our How to download iOS 10 right now guide. Some iPhone owners are experiencing problems connecting to their mobile network after updating to iOS 10, with their devices either not finding a network, or having greatly reduced reception. Many people suffering from this are on T-Mobile and the network is aware of the problem and is working on an update that they will push out to customers in the next few days. If you can't wait that long, it may be worth trying the solution above, where you downgrade to a previous version of iOS, and then update to iOS 10 via iTunes. For information on downgrading iOS 10, follow our how to uninstall iOS 10 and downgrade to iOS 9 guide. If you've noticed that your mobile data allowance is quickly being used up after upgrading to iOS 10, then the Wi-Fi Assist feature may be the culprit. Wi-Fi Assist was introduced in iOS 9, and it enables your iPhone or cellular iPad to tell when your Wi-Fi connection is poor. If it is, then the device will automatically switch to your mobile data. While this means you can happily browse and download without experiencing any slow down or loss of connection, it can also mean that you're using up your monthly mobile data allowance without knowing it, and it seems like the feature is turned on by default with iOS 10. To turn it off, go to Settings > Mobile and scroll to the bottom of the menu. There will be a switch next to 'Wi-Fi Assist', so make sure this is turned to 'Off'. If you've updated to iOS 10 and notice that you're no longer getting notifications when you receive an iMessage, check your notification settings by going to Settings > Notifications > Messages. Make sure all the toggles next to each option are switched on, and that the selected alert style is 'Banner'. A new feature in iOS 10 is iMessage effects, which are full screen animations designed to make your iMessage chats more entertaining. These effects include fireworks, lasers, shooting starts and an invisible ink feature. However, some iOS 10 users are reporting that they cannot see iMessage effects. If you can't see iMessage effects in iOS 10, the most likely cause of this is that you have the 'Reduce Motion' option turned on. While this option is useful for saving the battery life of your iPhone or iPad, or for minimising the effects of motion sickness when using your device when moving, it also prevents iMessage effects from appearing. To turn it off, open Settings and go to General > Accessibility > Reduce Motion and turn the Reduce Motion setting to 'Off'. If you can't delete apps from your iPhone or iPad after upgrading to iOS 10 then you're not alone. Users are reporting that when trying to delete an app they just see a message saying "Waiting", and the usual X icon to delete the app doesn't appear. To fix this problem first perform a hard reset of your iOS 10 device. Do this by pressing and holding the power button and the Home button at the same time for ten seconds until the Apple logo appears. If that doesn't help, check to make sure you're not installing any apps in the background while you try to delete other apps. To do this open the App Store then tap on Updates > Purchased. See if any of the apps have "Installing" next to them. If they are, put your device into Airplane mode, then tap on the apps to stop them. Next, turn off Airplane mode and download the apps one by one. You may also need to try resetting all your settings. Open up the Settings app and select 'General'. Scroll down and select 'Reset' then 'Reset All Settings'. Many iOS 10 users are noticing that when using a third party keyboard, such as Swype or Bitmoji, the keyboard becomes unresponsive and crashes. Most of the developers behind these keyboards know this is an issue and have released updates that have fixed compatibility with iOS 10, so the first thing you should do is check the App Store to see if there is an update waiting for your keyboard. If there isn't you will have to disable the keyboard by going to Settings > General > Keyboards and tap on 'Edit'. Next, tap on the minus button, or swipe left, on the keyboard you want to remove. If you've bought and downloaded custom ringtones, you may not be able to find them if you've updated to iOS 10. This is a problem that has happened in previous updates, and thankfully there's an easy way to get them back without having to purchase the ringtones all over again. Simply plug your iPhone or iPad into your PC or Mac and launch iTunes. Click on your device in the top menu, and under where it says 'On My Device' click 'Tones'. Now make sure the check box next to 'Sync Tones' is selected. and you'll be asked if you agree to removing and replacing your ringtones. Agree, and the sync process will start. If that doesn't work, check out our guide on How to restore ringtones to iPhone for more methods. There's nothing worse than an important alarm not going off, and sadly that's what some iOS 10 users are currently experiencing. If you've found that your alarms are either not going off at all, or they go off at the wrong time, then there's a straightforward solution. Open up the Clock app and go to 'Alarms', where you usually set your alarms. Click the edit button at the top of the app, then delete all of your alarms. Close the app, then reopen it and add your alarms back in. If that doesn't work you'll need to be a bit more ruthless. Go to Settings > General > Reset and tap on Reset All Settings. This will reset all your settings to default. It means everything you've configured will be set back to the way it was before you tinkered, which is annoying, but at least it means you can now reset your alarms and they will work again. If your device's screen no longer responds to touch inputs after updating to iOS 10, then unplug your iPhone or iPad and remove any case or screen protector. Clean your screen, then restart your device. If your device's screen still does not work, you can try adjust you 3D Touch settings. To do this, go to Settings > General > Accessibility > 3D Touch. You can then adjust the sensitivity. If it still doesn't work, you may need to contact Apple Support. If you've noticed that your iPhone or iPad has started to heat up when charging after being updating to iOS 10, don't panic. Even though it doesn't look like it, iOS 10 may still be updating apps in the background immediately after the update, so when it's being charged it may run hotter than usual. Give it time, and hopefully your iPhone or iPad will return to normal temperatures when charging. Some iPhone owners are reporting that when trying to sync photo albums from their Macs to their iPhones running iOS 10, the photos sync to the device, but their respective albums aren't showing. So, while the photos are on the iPhone, they can be difficult to find, as they're no longer sorted in the albums they usually appear in. One user on the Apple Support forum found that by opening a folder on their Mac called 'iPhone' they found lots of subfolders containing photos. Usually this folder and its subfolders get synced. To fix the problem, they added two new subfolders into the iPhone folder and tried to sync – and it worked, with all the albums then appearing as they should in iOS 10. A common problem with iOS 10 involves songs in playlists created in iTunes not appearing on the iPhone. This problem mainly involved Smart Playlists, and although they appear on phones, they now look empty. To fix this problem plug in your iPhone and open iTunes. Select your device and uncheck all playlists to stop them syncing. Apply the changes, then check the boxes to sync the playlists and they should now appear on your iPhone after the sync process has finished. If you find that graphically intensive games are now slow to open, and feel sluggish when played, then close down all of your open apps, then press and hold the power and home buttons for 10 seconds until the Apple logo appears. This resets the device, which should sort out any problems. 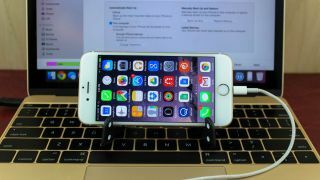 It's also worth making sure that you have the latest version of the game installed, as app makers may have released an update to make their apps and games work better with iOS 10. If you're using iOS 10 and you open up the Mail app, you may be greeted with a blank screen. A number of iOS 10 users are reporting this problem, and they all seem to have one thing in common: having an apostrophe in their email address. It appears that a bug in iOS 10 is preventing the Mail app from showing these addresses. So, if you do have an email address with an apostrophe in it, you'll have to wait for a fix from Apple. In the meantime, if you have other email accounts you can make emails to those addresses appear by removing the mail account with the apostrophe from the Mail app. The other email addresses will now appear. Many email accounts let you forward mail to another email address, so until a fix is released you could set emails that go to your email address with an apostrophe to be forwarded to another address. The process for this varies depending on the email provider, so visit the website of the company that supplies your email address for more information. We're in the first days of Apple's new operating system availability, and we can guarantee that there will be more iOS 10 problems discovered. Have you experienced any errors, glitches or issues that we haven't addressed? Feel free to leave them in the comments, and we'll add them to the ever-growing list. iOS 10 is good, but it's not perfect.